Janko Isidorović co-founder of Mainflux and Chair of EdgeX Foundry Applications Working Group gave a keynote presentation at the FIWARE Global Summit which took place in Malaga, Spain from 27–28 November. FIWARE is Europian Union Initiative with a mission to build an open sustainable ecosystem around public, royalty-free and implementation-driven software platform standards that will ease the development of new Smart Applications in multiple sectors. Currently, the FIWARE ecosystem is consist of more than 100 cities, 11 iHubs, various accelerator programmes, and strategic partnerships with GSMA, TM Forum, CEF, and ETSI. Within this ecosystem are FIWARE Summits conceived as a meeting place for developers, entrepreneurs, political decision-makers, thought leaders, business executives and investors. This year at Malaga FIWARE summit, speakers were officials from Europian Union, city officials from several countries and representatives of companies like Orange, Telefonica, NEC and services corporation Atos. 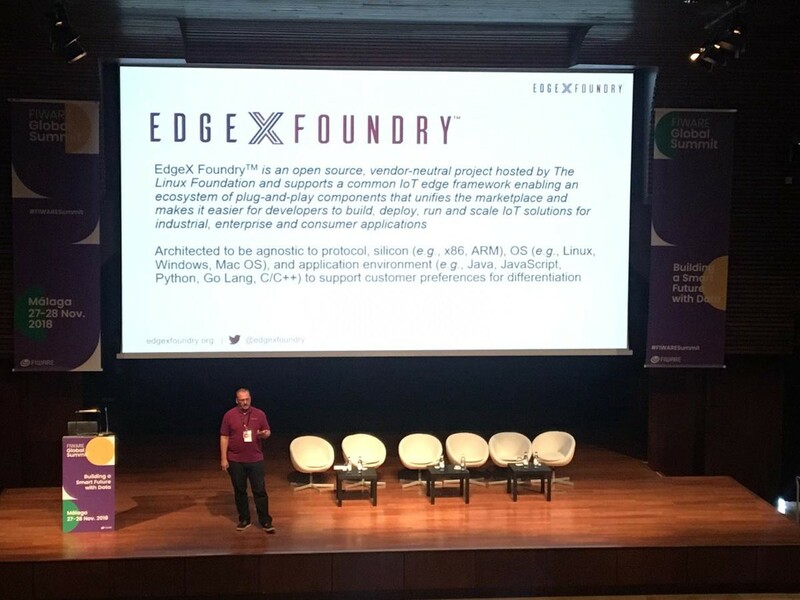 Mainflux co-founder and Chair EdgeX Foundry Applications Working Group Janko Isidiorovic gave a presentation about EdgeX Foundry Project on the first day of the summit. The subject of the presentation was “Enabling a Cloud-Native Edge for IoT Scale”. 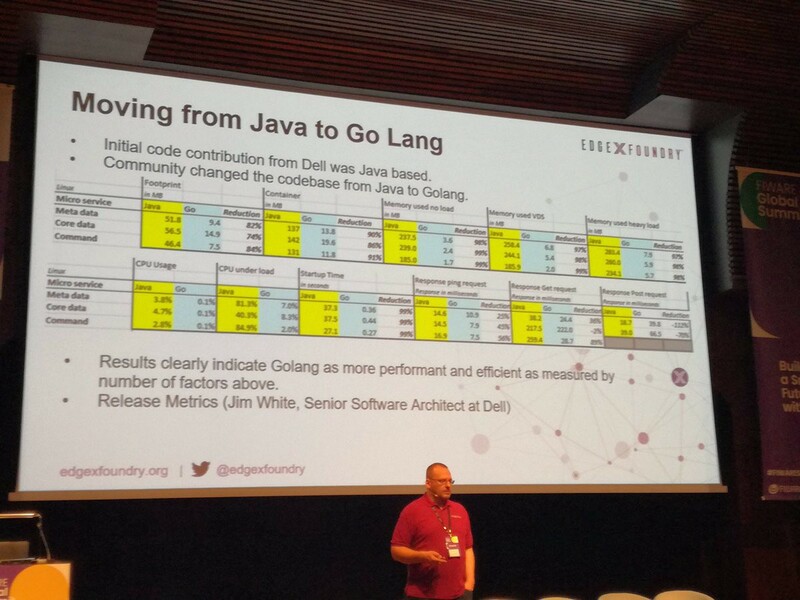 One of the highlights of the presentation is the test run by Jim White, the senior Software architect at Dell, which clearly indicates the superiority of Go Lang over Java as more performant and efficient on the number of factors for the EdgeX project. 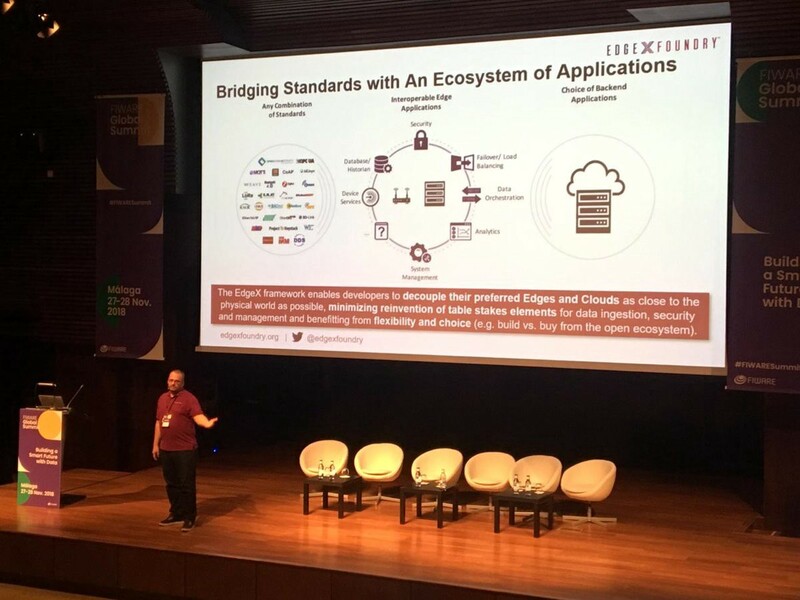 EdgeX Foundry is an open source project hosted by The Linux Foundation building a common open framework for IoT edge computing and an ecosystem of interoperable components that unifies the marketplace and accelerates the deployment of IoT solutions. Designed to run on any hardware or operating system and with any combination of application environments, EdgeX enables developers to quickly create flexible IoT edge solutions that can easily adapt to changing business needs. EdgeX Foundry members include companies like Dell, Toshiba, Samsung, Analogue Devices, and Intel. To learn more, visit www.edgexfoundry.org. Mainflux is a technology company offering a full-stack open-source, patent-free IoT Platform recognized by Linux Foundation and O’Reilly Media with software and hardware consulting services based on extensive working experience in fortune 500 companies. Mainflux is highly secure, scalable, open-source IoT platform written in Go and deployed in Docker. It serves as software infrastructure and set of microservices for development of the Internet of Things Solutions and deployment of Intelligent products.